Located in bustling Strawberry Square, Freshido first started as an idea between two friends. “We asked ourselves why does fast food have to be unanimous with unhealthy food? Why can’t fast food also be healthy,” says Owner Tia Pham. 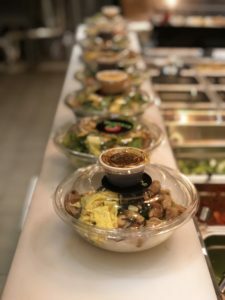 For those who haven’t visited Freshido before, the menu is built around flavors from Chinese, Korean and Japanese cuisine. “We serve a wide assortment of freshly prepared raw fish and cater to those who care about the environment. We believe food should be sustainable for generations to enjoy. Therefore, our ingredients are all sourced locally to guarantee its freshness and sustainability,” says Pham. 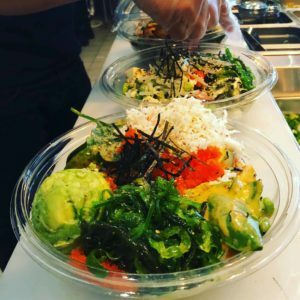 The menu at Freshido is customizable, customers can pick their base, protein, toppings and whether they want it all served up in a bowl or a wrap. A few favorites have emerged from the many options. 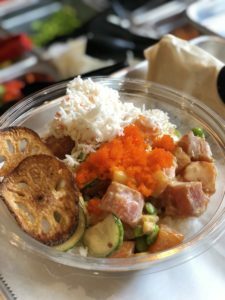 Freshido Special: Salmon (raw), tuna (raw), cucumber, mango, edamame, crab salad, Masago, lotus chips, Freshido classic and sriracha aioli sauce. Gangnam Style: Bulgogi beef, cumber, carrot, edamame, cilantro, egg, kimchi, bean sprout, scallion, sesame seed, sweet gochu sauce. Bibim Chicken: Bulgogi chicken, sweet mushroom, baby spinach, pickled red pepper, corn, bean sprouts, scallion, sesame seed creamy white sauce. Bubble teas: A tea base mixed with milk, and flavored tea with tapioca pearls or fruit jelly added. Freshido offers three varieties of the trendy beverage.